"It's been a while since we had pajeon (literally translated pa means green onion/scallions and jeon means pancake, thus green onion pancake) since our California days with unlimited makgeolli (fermented rice wine). But for the sake of adding to our recipe list, we decided to make haemul pajeon (seafood pancake) for tonight while the kids spend the night at Komo's house (Auntie's). There are endless variations of this dish which can be made by adding or omitting certain ingredients according to personal preference." 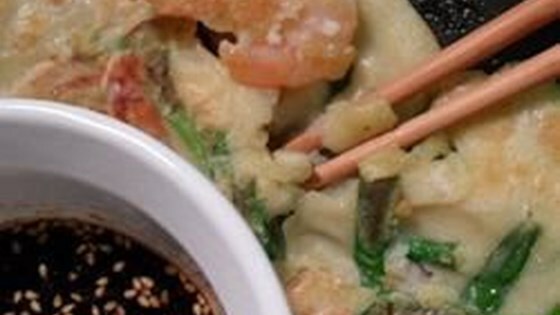 Combine seafood mix, water, flour, 1 bunch scallions, eggs, garlic, salt, and pepper in a bowl; mix until batter is thick. Heat olive oil in a nonstick skillet over medium-high heat. Pour half the batter evenly into the skillet. Cook until bottom and edges are browned, 7 to 8 minutes. Flip and continue cooking until the opposite side is browned, 7 to 8 minutes more. Transfer to a plate. Repeat with the remaining batter. Combine soy sauce, 1 stalk scallion, rice vinegar, sesame oil, brown sugar, gochugaru, and sesame seeds in a bowl. Serve pancakes with dipping sauce. Light soy sauce an be substituted for the soy sauce. Garlic powder can be substituted for the fresh garlic.